Kwanzaa begins December 26 and runs for seven days, ending on the first of the year. Interior designer Nicole White Quinn recommends using the holiday as inspiration to “get busy adding loads of Kwanzaa influence to your decor.” Are there any special objects, artwork or textiles you pull out this time of year? What’s the story behind them?If you celebrate Kwanzaa, please tell and show us how your family celebrates and which part of this weeklong holiday means the most to you. The seven principles of Kwanzaa are as follows: 1. Umoja (oo-MO-jah): Unity 2. Kujichagulia (koo-jee-chah-goo-LEE-ah): Self-determination3. Ujima (oo-JEE-mah): Collective work and responsibility4. Ujamaa (oo-jah-MAH): Collective economics5. Nia (NEE-ah): Purpose6. Kuumba (koo-OOM-bah): Creativity7. 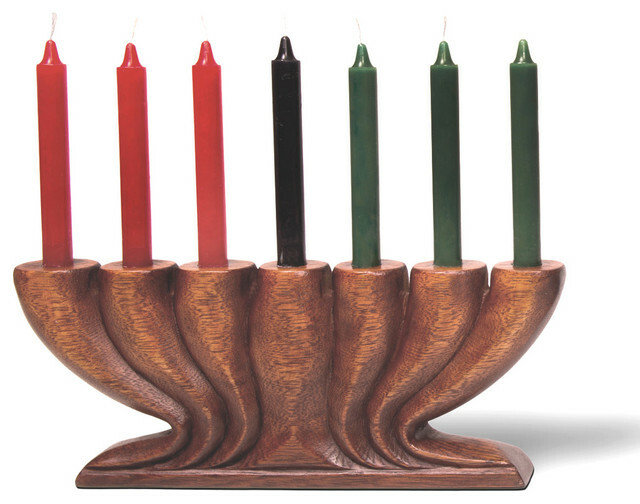 Imani (ee-MAH-nee): FaithThe principles are expressed by the use of a kinara, which holds seven candles — three red, three green and one black — which can be purchased at a local craft store or from a store specializing in African wares. The rich warm look of the candle holder.